So after the humongous Sunday lunch I was left with a fair bit of chicken and a pile of bones,whats a Gal to do I ask you? Make chicken soup of course.Here you go,easy peasy. Boil carcass with a few onions,carrots,Swede or any veg you have left over to make stock. set aside stock,dice some onions and cook in a little oil until soft,add diced carrots,swede and potato,return stock to the pan and simmer for about 30 mins. 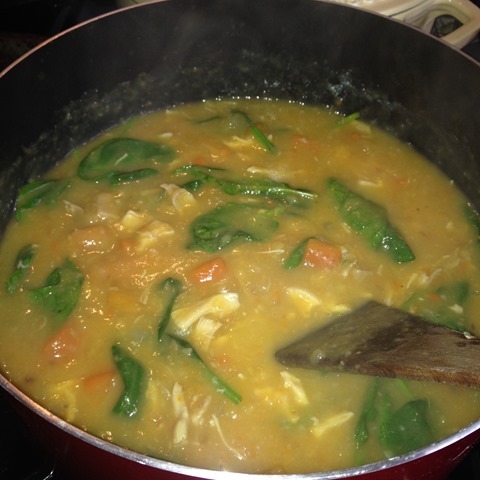 when all the veg are soft,put around half the soup in a blender and whiz it up,this adds thickness if you dont like a watery kind of soup,return to the pan and add your left over chicken,I added a handful of spinach just because I love it and its so good for you. Season to your own taste and Viola! perfect Winter comfort food,serve with a crusty bun and feel virtuous for being so clever with your leftovers and also for being super healthy at the same time! Previous Article Sunday,the lurgy and cake…. Next Article Things that make me go Ooh!